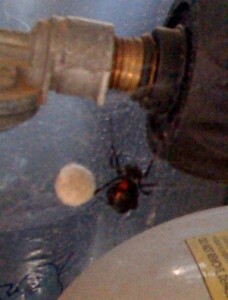 I found this black widow spider while cleaning my grill about a month ago. I reached underneath to turn on the propane (about six inches to the right of this picture) and felt some spider webs. Annoyed about having to clean it out before using the grill, I opened the door and saw the little creature pictured. It was hanging by what I assume is a giant egg sac, and was turned so that its telling red markings were pointed right at me. I’m not afraid of spiders as a rule, and having lived in the desert southwest for 25+ years I have encountered about every nasty creature out here, including scorpions, widows, brown recluses, and rattlesnakes. What got me was how close I had been to just blindly grabbing what was, and I am not exaggerating, the largest black widow I have ever seen. It was the knowledge that my blind groping into unseen corners almost made my day a tad bit worse than just having a dusty grill. I think it is that fear of the unknown that often cripples writers. The most common question writers get is “Where do your ideas come from?”. They don’t know. None of us do. They come from the dark parts of our brain when we start reaching there blindly. We feel around for something we can’t name, and pull pieces together into a coherent whole (we hope). But what if you reach in there and nothing comes out? Or what if it is trash? Or what if you get bitten? It leads to a whole list of secondary excuses for not writing, of not challenging yourself, of not trying something risky. Really it’s about fear. If you never go under the grill, you’ll never get bitten. In this case, after I came down off the roof and took the picture with my iPhone, I squished the spider and the egg sac into gooey bits. I hosed the hell out of the grill, then got back to cooking the steaks. They came out great. I may be stretching the metaphor a bit here, but you can’t get the juicy steak if you don’t reach under that grill.